New Delhi:The Lenovo ThinkPad X1 Carbon laptop is clearly targeted at professionals and business users. It has all the trappings which make the ThinkPad laptops, that have been around for the last six years, distinct—matte black colour, the keyboard layout, the red TrackPoint stick and the ports on the side spines. Looks: While it does appear a bit jaded at first glance, the laptop also has more than its share of modern elements to display. There is much similarity with the Dell XPS 13 in terms of slimness, reduced footprint and the thinner bezels around the display. It feels great to hold and use. Besides, the carbon overlay over the plastic, used on the lid and the keyboard deck, has a welcome softness about it. 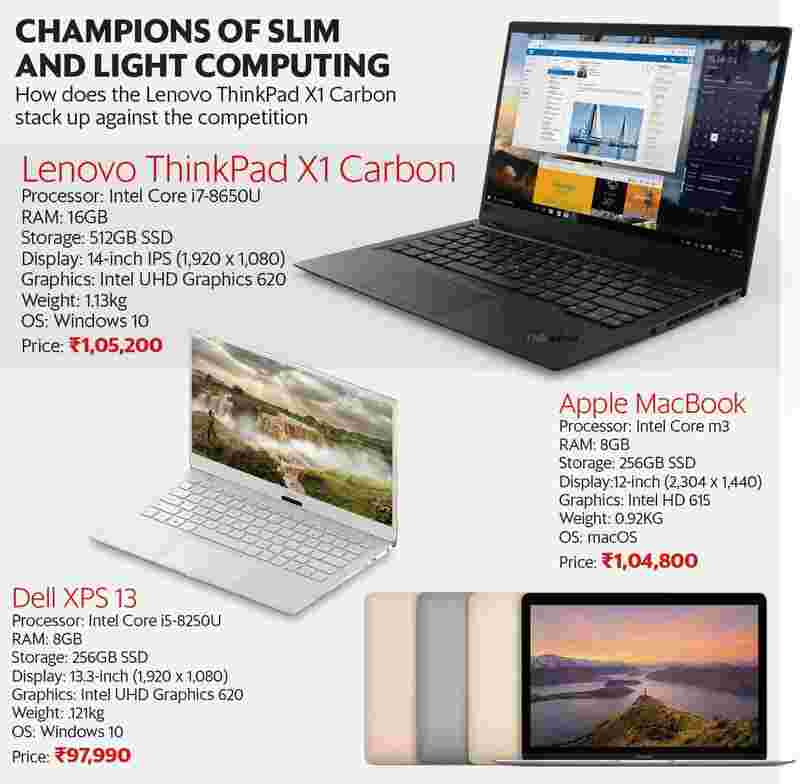 The X1 Carbon definitely is upping the game in the Windows laptop ecosystem where it is competing against Dell XPS 13 and HP Spectre 13, for instance. Weight: It tips the scales at just 1.13kg, which is slightly lighter than the XPS 13 (1.21kg). Lenovo says this has passed military grade ruggedness tests, but that isn’t enough to stop fingerprints from showing on its surface if you hold it with greasy hands. Performance: The variant we tested runs the Intel Core i7-8650U processor, the newest from Intel’s 8th generation processors. There is 16GB RAM to move things along at a brisk pace, and there is more than enough space with a 512GB SSD. Performance is fantastic, and you will not have any issues running any software that you can think of, for productivity. However, the small compromise, when multitasking, is that the machine tends to heat up a bit on the underside when stressed considerably—this might become a tad uncomfortable if this is in your lap. Fans do manage to bring down the temperatures quickly enough though. Battery life is quite acceptable too, with the X1 Carbon lasting around eight hours on a single charge when used in a typical office environment. Display: The touchscreen display real estate is a 14-inch IPS display (our test machine has the 1,920 x 1,080 resolution). This ticks off the checklist—good brightness levels, well distinguished though not very vibrant colours and comfortable viewing angles since this screen isn’t reflective. The latter is perhaps the most important element for a display that you’ll perhaps be spending hours working on, every day. Verdict: Lenovo has ensured that the X1 Carbon integrates all the elements that are perhaps essential in a top-notch business laptop. It has a great keyboard, there is a fingerprint sensor, lots of ports (and no need for adaptors) and a non-reflective display. This is a machine meant for the serious workplace usage, and it really doesn’t have many rivals when it comes to that sort of single-minded focus.